Dermal Filler Market size was valued at USD 5.8 billion in 2017 and is expected to witness growth of over 6.6% CAGR from 2018 to 2024. Increasing obsession about physical appearance, rising disposable income and growing awareness about facial aesthetics will drive dermal filler market over the forecast timeframe. Shift in preference from invasive to non-invasive surgical procedures should accelerate industry growth. According to The International Society of Aesthetic Plastic Surgery (ISAPS), the number of non-surgical cosmetic procedures has increased by around 9% annually in 2017. Cost-effectiveness offered in some countries such as China, India for dermal filler therapy will support regional dermal filler market growth. Growing geriatric population will act as high impact rendering factor for industry expansion. Rising number of elderly people undergoing dermal filler therapy to restore lost volume and uplift sagging skin should escalate business growth. Hyaluronic acid therapy is most common therapy performed on elderly, as loss of hyaluronic acid with age results in dehydration and wrinkling of skin. According to a study by Dermatology Centre of Acadiana, population aged 55 years and above accounted for about 49% of total patients undergoing dermal filler treatment in the 2016. With increasing awareness about anti-aging cosmetic procedures, the market is anticipated to grow lucratively during the forecast period. Rising number of facilities such as medical spas and rejuvenation centers will positively impact industry growth. According to American Med Spa Association, facial fillers along with other procedures formed largest revenue-generating segment in medical spas across the U.S. in 2017. However, complications such as infections and biofilm formation related with dermal filler will restrain business growth to certain extent over the coming years. Biodegradable fillers segment held largest market share of around 88% in 2017 due to safety offered by this type of fillers. Complications related with the use of dermal fillers disappears spontaneously as biodegradable substances are eventually metabolized by the body. Juvederm XC, a hyaluronic acid developed by Allergan is commonly used to reduce facial lines. Industry players are increasingly investing into development of biodegradable fillers that removes necessity of allergy testing. Growing demand for enhancement of cosmetic value for shorter timeframe has escalated demand for temporary biodegradable dermal fillers. Temporary biodegradable dermal fillers segment is estimated to grow by 6.2% during the forecast period. This type of dermal fillers last less than year, hence it is frequently adopted by patients wanting to experiment with soft tissue augmentation, but do not want new look for prolonged time. Hyaluronic acid segment accounted over USD 4.5 billion in 2017. Hyaluronic acid is associated with dehydration and wrinkling of skin. It is commonly adopted by elderly people to correct facial lines and reduce wrinkling. After Botox, hyaluronic acid is most commonly performed non-surgical cosmetic procedure in the U.S. Large number of approved products, lower risk of complications and growing adoption should accelerate segment growth during the forecast period. Autologous fat segment is estimated to experience robust growth of 8.9% during the forecast period. Less invasiveness is major driving factor for the segment growth. Moreover, applications of fat dermal filler including treatment of facial scars, nasolabial folds, forehead and temporal augmentation should escalate its adoption rate over the coming years. Facial line correction segment held more than 40% market share in 2017 owing to growing demand for remove/reduce effects of ageing appearing on the skin. Growing beauty consciousness and availability of several non-surgical cosmetic procedures will positively impact industry growth. Soft tissue fillers are capable of smoothening frown lines between the eyebrows, nasolabial folds and skin. Thereby, resulting in high adoption and increasing segmental growth. Lip enhancement segment will witness 7.7% CAGR during the forecast period due to growing demand for lip augmentation. Dermal fillers offer predictable and controlled outcomes, thus largely adopted for procedures such as lip augmentation. Hyaluronic acid dermal filler is most commonly used for lip enhancement. Frequent launch of new products in the market, designed for lip enhancement should support business growth. Dermatology clinics held largest market share of around 57% in 2017 owing to personalized and customized cosmetic treatment provided at this medical setting. Increasing acceptance of treatments such as anti-aging coupled with rising number of facilities and professionals providing non-surgical cosmetic procedures should drive industry growth during the forecast timeframe. High adoption of facial lift and lip enhancement procedures by numerous celebrities has positively affected industry growth. Constant addition of innovative products and treatments offered by dermatology clinics should stimulate segment growth. 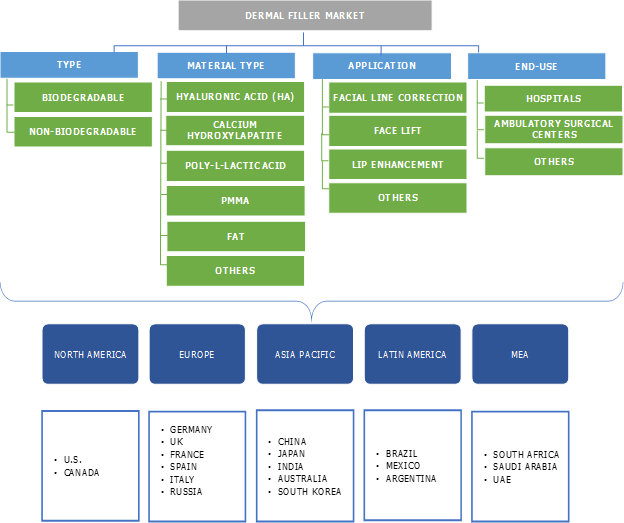 U.S. dermal filler market dominated North America Dermal Filler market in 2017 and is anticipated to experience 5.8% CAGR during the forecast period. Growing adoption of facial aesthetic procedures, shift in preference from invasive to non-invasive procedures coupled with rising awareness about soft tissue fillers will drive U.S. dermal filler market. Availability with numerous products in market with frequent introduction of innovative products should positively impact industry growth. 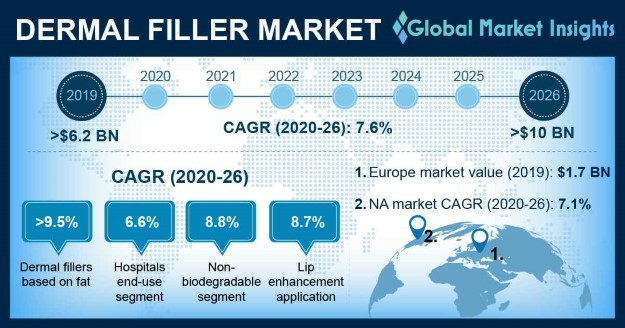 Australia dermal filler market will witness remarkable growth of 8.2% throughout the forecast period owing to growing demand of facial aesthetics and rising awareness about non-invasive cosmetic procedures available in the market. Industry players are partnering with local distributors to increase their market share as well as expand customer portfolio of the company. Growing adoption of anti-aging cosmetic therapy should further propel industry growth. Some of dominant market players operating in global dermal filler industry are Allergan, Galderma, Merz Aesthetics, Syneron, and Cynosure among other players. Companies are undertaking strategies such as strategic partnership, acquisition and product launch to sustain their market position and strengthen product portfolio. For instance, Merz Aesthetics introduced Belotero Lips in April 2018, developed specifically for the effective and safe treatment of perioral lines. Market players are partnering with local distributors of the region especially Asia Pacific to gain significant market share and expand customer base of the company in the region. Dermal fillers have gained subtle enhancement in facial aesthetics as topical therapies and lasers available in the market are insufficient to provide complete volumetric rejuvenation. Industry trend is towards enhancement with emphasis on natural look, thereby popularizing minimal invasive cosmetic procedures including soft tissue fillers. Technological advancements include longevity of restored volume post filler injection. Industry players are focusing on developing dermal fillers with lower molecular weight and high viscosity, resulting in longevity and reduced biodegradability. Vermillion-shaping and white roll-filling is largely adopted by patients wanting to enhance shape of lips using fillers. Companies such as Allergan partner with clinics and other medical settings offering these services to provide training to professionals and create awareness about soft tissue fillers. With increasing demand and adoption due to improved injection practices, constant introduction of innovative products and treatments, the dermal filler industry is forecasted to witness significant growth of 6.6% over the coming years.